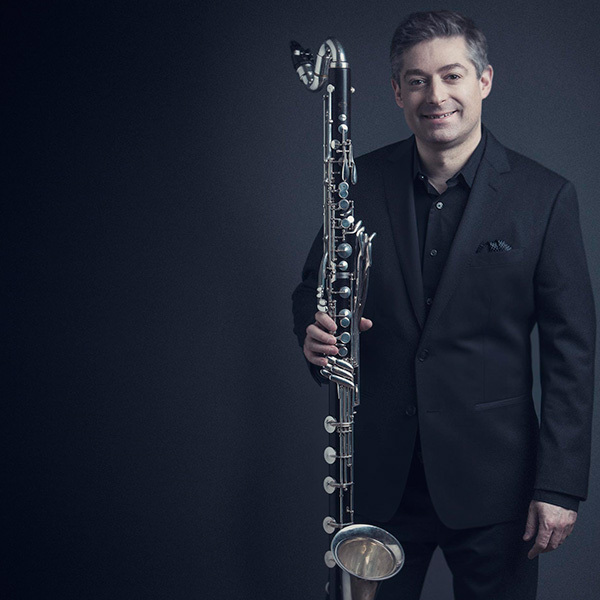 Known for his virtuoso energy on stage, creative musical arrangements and an entertaining way of speaking with the audience, Peter Stoll is one of Canada’s most innovative and versatile clarinetists. He was a prizewinner in the International Clarinet Society Competition, and also Solo Clarinetist with the World Orchestra of Jeunesses Musicales in Berlin and Vienna, which was broadcast on live television across Europe. Peter won First Prize in Chamber Music at the National Competitive Music Festival, for whose 50th Anniversary edition he was invited back as Woodwind Adjudicator, and as soloist in the Gala Celebration Concert in Winnipeg. A graduate of the Faculty of Music, University of Toronto, he received his Master's of Music degree in Performance from Indiana University. His teachers have included James Campbell, Avrahm Galper and Ronald Chandler. Peter has been guest soloist with orchestras in Canada and the United States, and was invited to Russia for solo performances with the Saratov Philharmonic's “Volga Wind Ensemble” and to present masterclasses at the State Conservatory. International performances have also included twice at the ADeVantGarde Festival in Munich, Germany, as well as Finland, Great Britain, Holland and Belgium. In October 2013 he was flown to Japan to take part in the Yamaha Music Foundation’s “Junior Original Concert” at Bunkamura Hall in Tokyo. In October of 2014 Peter travelled to three cities in China on a new music exchange with conservatories there, organized by the University of Toronto. Principal Clarinetist of the former Toronto Philharmonia for 10 years, Peter has continued to perform with many regional ensembles, including the Toronto Operetta Theatre, Toronto Masque Theatre, Opera York, and the Talisker Players. He is a member of the Trio d’Argento (flute, clarinet and piano), who recently recorded “Piano Centric”, a CD with members of the Canadian Brass, released in February 2016 on the Opening Day label. The Trio’s demo video can be found on Youtube. Summer festival performances have included a tour with the Swiss Piano Trio, the Ottawa and Vancouver Chamber Music Festivals, the Festival of the Sound, Manitoba's Clear Lake Festival, the Niagara International Chamber Music Festival, the Banff Centre for the Arts, the Ottawa Valley Festival, the Toronto Summer Music Festival and the Music Garden, and as a Mentor with the Boris Brott Music Festival's National Academy Orchestra. Peter teaches clarinet, chamber music, performance studies and The Business of Music at the Faculty of Music, University of Toronto. He is also a member of the Royal Conservatory of Music's National College of Examiners, and is much sought after as an adjudicator at music festivals across the country. In 2014 Peter served as the chief compiler of the new Clarinet Syllabus for RCM Examinations, which he presented in lecture-recital at a convention of the International Clarinet Association in Baton Rouge, Louisiana, and on the international “Clarineat” web podcast. He continues to serve as the Winds Area Specialist for RCME. Other performance highlights have included concerts with the Gryphon Trio, pre-eminent Canadian percussionist Beverley Johnston, accordion virtuoso Joseph Macerollo, solo and chamber music for visits by world-renowned composers Kryzstof Penderecki, Chen Yi and Anders Hillborg, as well as serving as Artist-In-Residence for the Silverthorn Symphonic Winds. Peter recently performed the Canadian premiere of noted American wind ensemble composer Brian Balmages' concerto “Escapades” with the composer conducting. Peter is an endorsing artist for D’Addario Woodwinds Canada.